For years, I didn't believe in using an ad blocker. As a content creator, I understand the importance of views, impact, and reach. 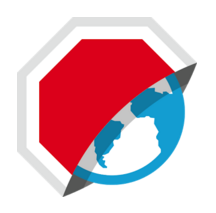 But, as of a few months ago, I've started using Adblock Plus with Chrome. There were too many intrusive ads which would open up separate tabs, refuse to close, or make it hard to find the content I was after. This was happening on many more sites than I was used to. As such, I made the jump. With my Android tablet, the problem continued. Compounding that was the fact that there is no "good" mobile browsing experience. Many sites aren't designed with mobile in mind, so it is a pain to browse. Throw in the ads and you get the picture. Adblock Browser is a fairly decent solution to this problem. Rather than acting as an add-on for the existing browser, it is its own entity. It comes loaded with the default search engines, of which you can remove or add your own preference. Additionally, it can import your bookmarks from Chrome. Assuming you're using Chrome as your primary desktop browser and sync with your Google account, it's easy enough to port the bookmarks from desktop to mobile and from Chrome to Adblock. As of yet, I haven't encountered any major issue with the browser. I still primarily use Chrome for mobile browsing, but if a site is too problematic because of ads, it's nice to know that I have Adblock ready to go.